The Queen Mary’s Most Haunted Cabin Now Available For Check-In! 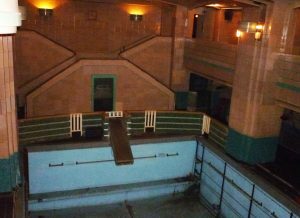 I grew up hanging out at the Queen Mary. I loved spending time on the historic ship and even worked in the ballroom many times as a Disc Jockey. Years of going to their Halloween spectacular, Dark Harbor, and going on the haunted tours, left me even more in love with the legends surrounding this paranormal playground. Spending the night in the most haunted ship in the world was a fun adventure, too. Although I hoped for some – I didn’t have any scary or supernatural things happen, but I guess it just wasn’t the right night or the right room. Maybe I need to try again…in Cabin B340! The room will include a chest with unique items available for guests to amplify their overnight haunt experience, including a Ouija board, tarot cards, crystal ball, and ghost hunting equipment. When I am lucky enough to go, I will have my camera ready! 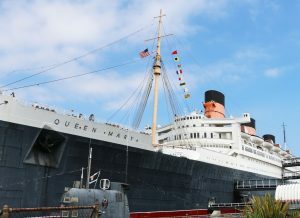 For the first time in 30 years, the Queen Mary in Long Beach, CA will let you stay in what many believe is the historic ship’s most haunted room. Stateroom B340, which has reported paranormal activity for years, can be rented out beginning Friday, April 13. Stateroom B340 and other areas on the ship, like the pool, have had a large volume of recorded paranormal activity with many stories of haunted encounters noted in the ship’s logs. Reports date back to the final ocean voyage in 1967 and include complaints from guests staying in B340 claiming that someone was knocking on the door in the middle of the night. Other complaints include bathroom lights turning on by themselves, the sink faucet turning on and off on its own, and unexplained bathroom doors shutting. 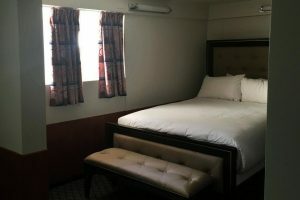 Some guests have reported the covers of their bed being pulled off while asleep and waking to see a dark figure standing at the foot of the bed. The Queen Mary’s year-long haunted attractions and tours continue to draw thrill-seekers of all ages in 2018 with continued updates and enhancements. 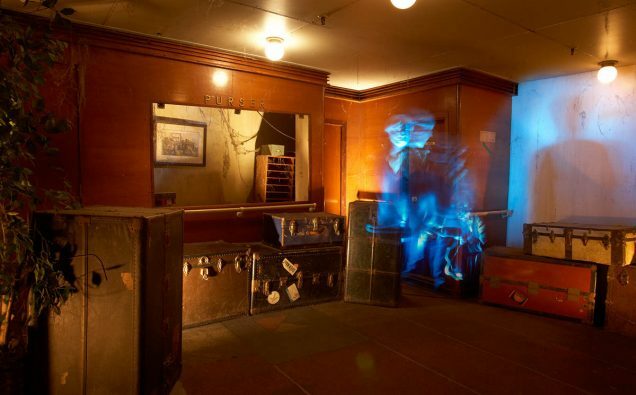 Since its opening in winter of 2017, the re-inspired Ghosts and Legends Tour has added more frights with a new scene, more ambient lighting, and elevated scare factors all in hopes to strengthen the presence of the Queen Mary’s resident ghosts. Additional haunted attractions offered onboard the Queen Mary include Paranormal Shipwalk, Dining with Spirits, and Paranormal Investigation. 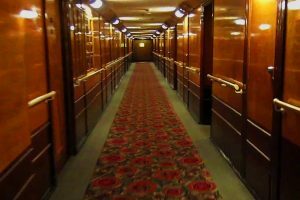 The Paranormal Investigation tour invites guests to join ship para-investigator and ParaXplorer Project founder Matthew Schulz as he leads visitor investigators into the depths of the RMS Queen Mary’s purported active locations.